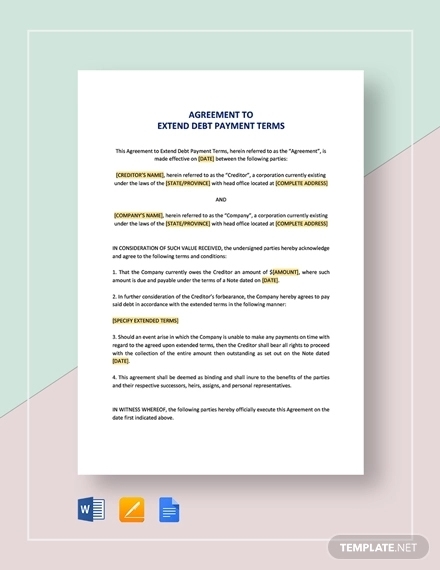 A debt agreement contract is a formal document that specifies the terms, limitations, and scope of the discussion that a debtor and a creditor has agreed upon. 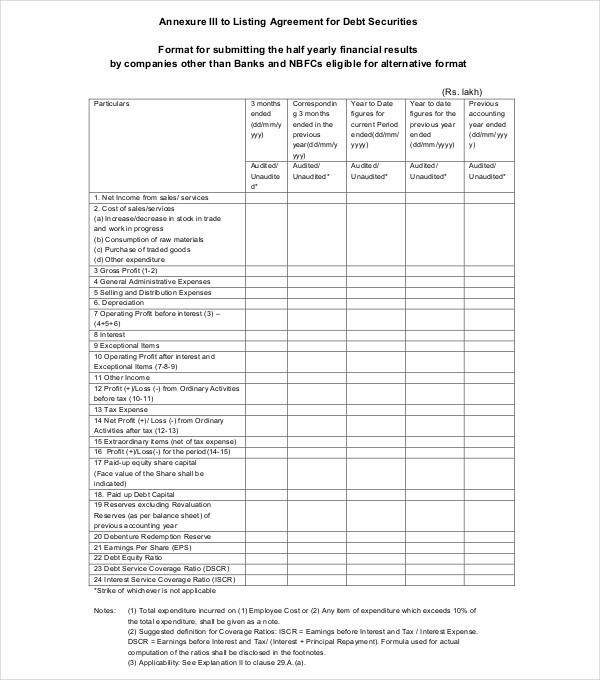 Just like when using Sample Letter of Agreement Examples and General Partnership Agreement Samples, it is essential for you to make sure that you are fully aware of the document’s content. Browse through the entire contract before signing any debt agreement contract handed to you. 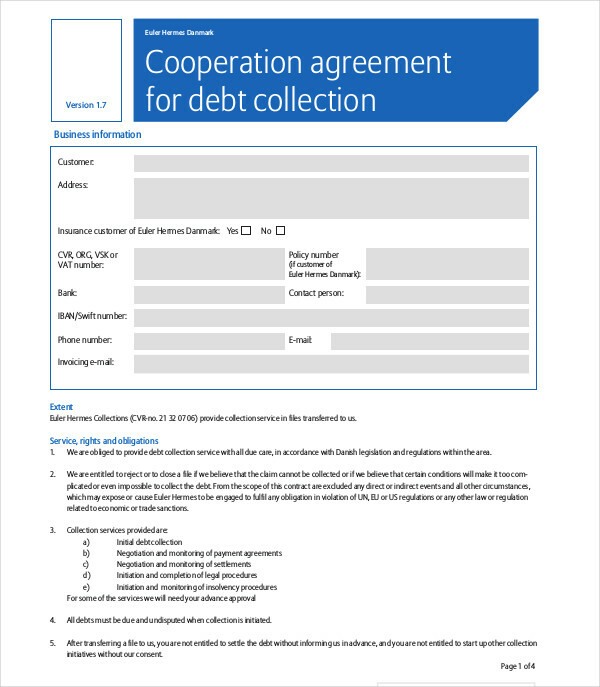 Review the selection of debt agreement contract examples below for you to be more aware of the document’s content specifications. A debt agreement is the contract that discusses the amount of money that a creditor will get within a particular time period and time frames as the settlement or payment of another entity’s debt. 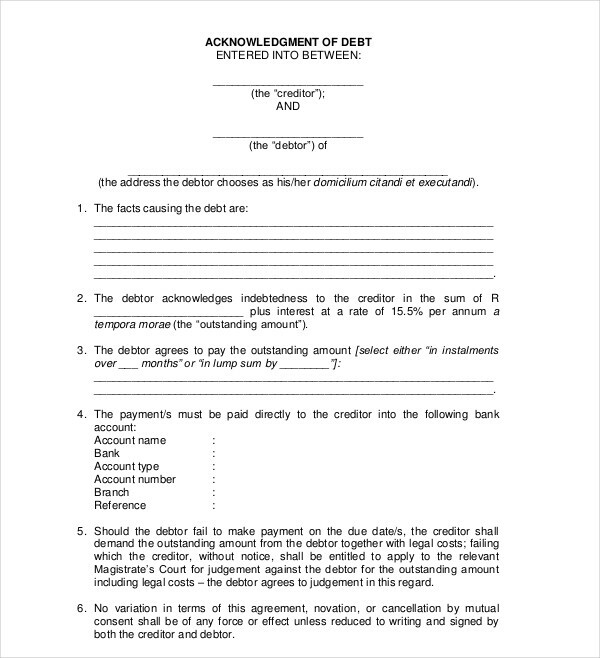 A debt agreement, like a dissolution agreement example, is considered as a binding document. 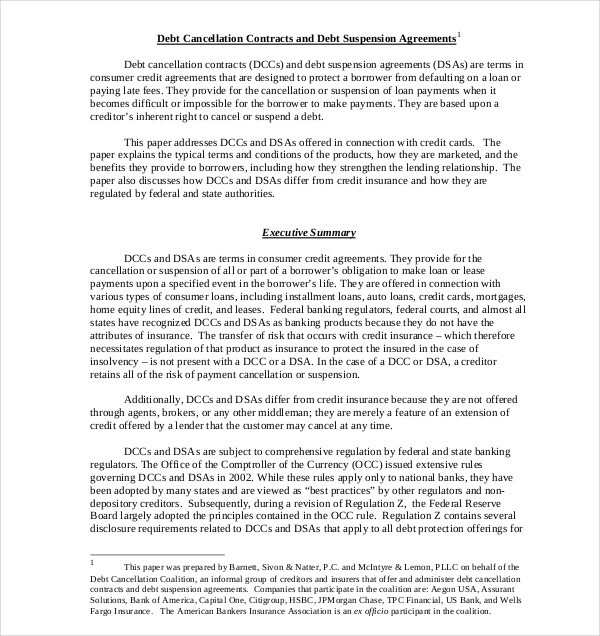 Hence, it can be used as a proof or evidence whenever there are disputes that will occur in the future with regards the debt-related transaction where the document has been used. A debt agreement presents the entirety of the transactions or processes that the creditor and the debtor will immerse themselves in. It also gives an idea about the regulations and rules that must be followed as the document takes effect. This is the reason why it is essential for an expert to administrate the development and usage of the debt agreement contract. A debt agreement can be considered as an act of bankruptcy, which means that this can affect the processes of your application for credits in the future. 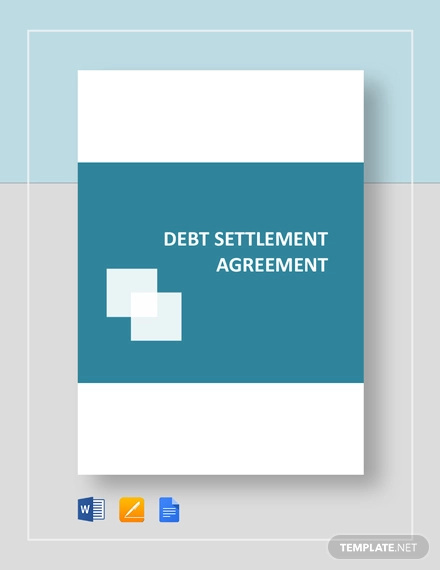 A debt agreement is commonly and mostly focused on the payment of unsecured debts. This means that you are still liable from other kinds of debts. A debt agreement allows security creditors to sell items or properties that you have enlisted as a security for your credit once you fail to pay your obligations within the specified date stated in the debt agreement. You will be required to have a debt agreement administrator. This means that you need to provide all the necessary details that are essential for the transaction, even with the changes that you are experiencing at any circumstance related to the debt agreement. Sharing these information can be very private but it is one of your obligations when you enter a debt agreement. Having a debt agreement can actually affect your business as well as the perception and impression of your stakeholders toward your corporation. Especially if you do not own the business name that you are using for trading, it is essential for you to disclose the content and usage of the debt agreement to all the entities who are doing business transactions with you. One of the advantages of having a debt agreement is that you can ensure that the transaction will be recorded. This means that you can protect your rights while delivering all your responsibilities. This document can also set the limitations of the transaction and the scope in which you are obliged to pay specific amounts at various time duration. 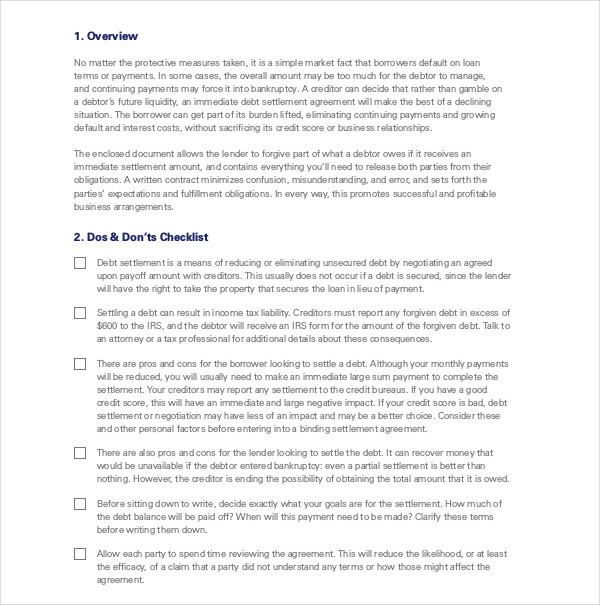 Be very mindful when creating and using a debt agreement. 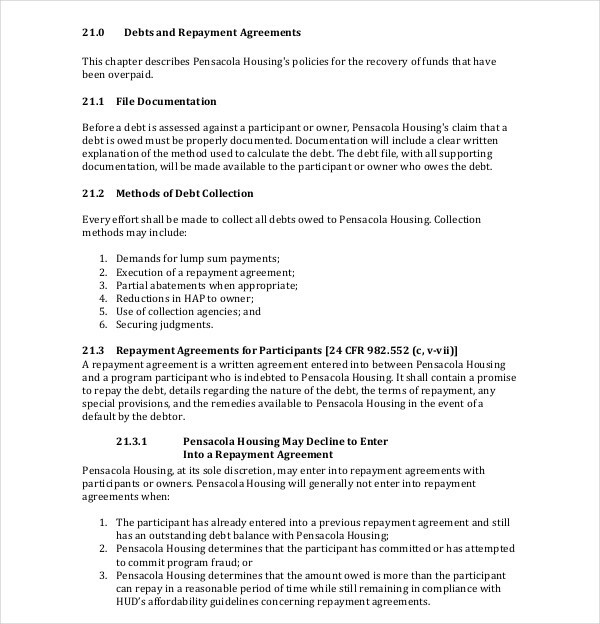 You have to make sure that you will be careful when formatting the document and when putting together all the content that is necessary to be seen in the debt agreement. Start by referring to our downloadable debt agreement contract examples so you can develop an effective and comprehensive debt agreement.